Mrs Dent; Christie's, London, 29 February 1896, lot 85, 'La Colombe sauvée: Portrait of Miss Mary Payne, daughter of George Payne, Esq., afterwards Mrs. Dolphin' (sold 375 gns.). W. Roberts, Sir William Beechey, R.A., London, 1907, pp. 166, 276. 1913 Luton Hoo Inventory, p. 23, no. 87, in the Drawing Room. London, Royal Academy, 1827, no. 86, as 'Lillian'. The sitter was the daughter of Thomas Payne (not George Payne as stated when the picture was sold in 1896) of Edstaston House, Shropshire and Brook Street, Grosvenor Square, London. She married Vernon Dolphin of Eyford, Gloucestershire on 16 July 1822, when still a minor, by the consent of her widowed mother Mary Payne. She later divorced Vernon Dolphin and married the Frenchman, Général Davesiès de Pontès, to whom she had been engaged before her marriage to Dolphin. Roberts (op.cit., p. 166) states that the composition of this portrait was inspired by a passage in Henry Hart Milman's epic poem Samor, Lord of the Bright City, published in 1818. The poem is set in the mid-fifth century A.D. and tells the story of the Saxon invasion of Britain during the time of Vortigern, Prince of South-East Britain. This painting is an accomplished example of Beechey's work and echoes the drama and grandeur of Sir Joshua Reynolds' early full-length portraits. 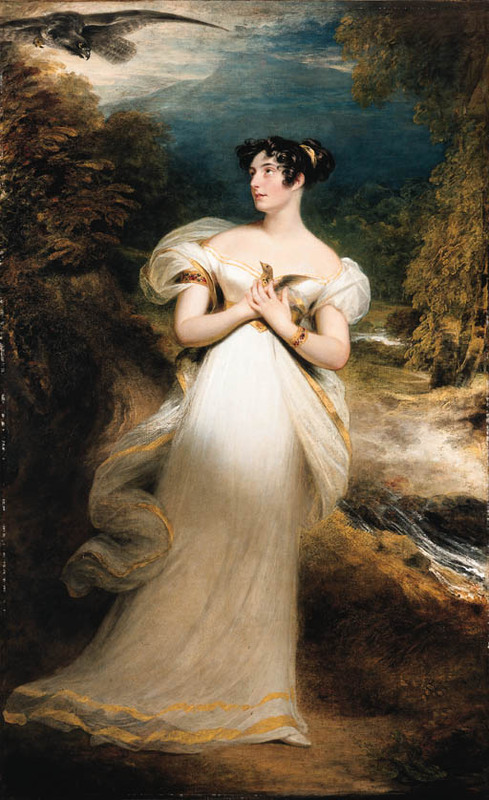 Beechey has combined the stateliness of the full-length portraits executed for the Royal Family, during his time as portrait painter to Queen Charlotte and other members of the Royal Family, with the drama and tension of Milman's epic poem.